This entry was posted in Uncategorized and tagged Chinese, Fong, Happy, Lunar, New, Otto, Sir Fong, Year by christao408. Bookmark the permalink. So, Lunar New Year is also celebrated in Thailand.Happy Lunar New Year! Happy New Year – do love your card. What big blue eyes you have… Happy New Year to both of you! What a lovely greeting! Happy New Year! 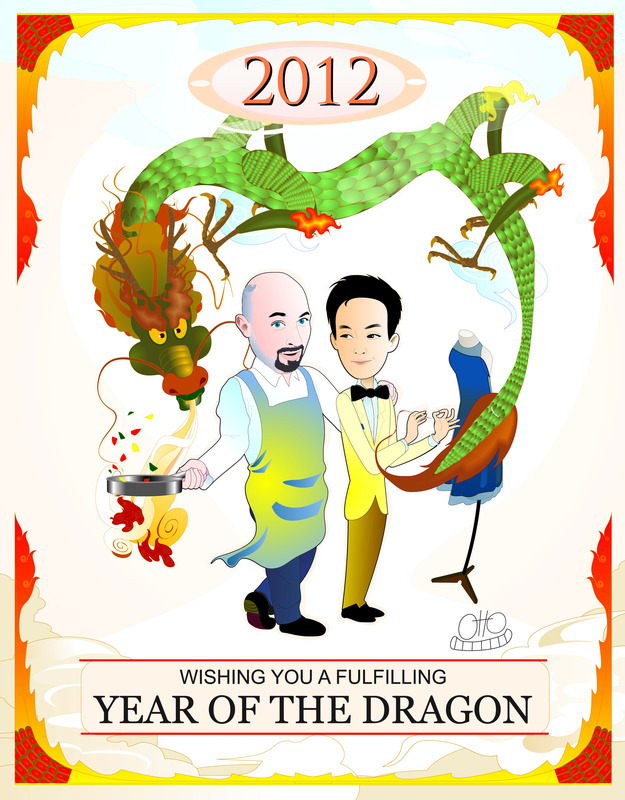 The cartoonist is excellent, perfect posture and very handsome ‘chef / fashion designer’ couple. Wish you both Happy Chinese New Year! very nice illustration. 🙂 Happy New Year! Ooh. Using a dragon to make stir fry. Fancy :] HAPPY NEW YEAR! I love the card! It is you to a Tee! hehe! Happy New Year! This is all kinds of awesome!!! that looks so cool. hope you both had a festive one in bangkok. Fantastic cartoon! Happy New Year, Chris & Tawn!